Dry eye syndrome is one of the most common causes of eye discomfort. To manage your dry eye symptoms, you can visit an eye doctor or ophthalmologist for dry eye treatment in Chicago, and take some steps at home to prevent dry eyes. Here are some helpful tips for fighting dry eye symptoms this winter. 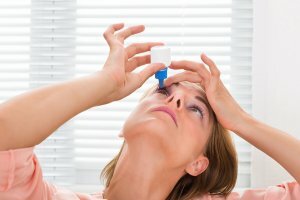 The first and simplest line of defense against dry eyes is using eye drops regularly. Your eye doctor or ophthalmologist can recommend the best type of artificial tears for your condition. Artificial tears will keep your eyes moist, and combat other dry eye symptoms like itchiness, watery eyes, and irritated or sore eyes. You can use artificial tears as often as necessary to provide relief of dry eye symptoms. If your symptoms don’t improve, your eye doctor can prescribe a different form of dry eye treatment. Dry air will further irritate your dry eyes, and you should avoid sitting in front of a heating or cooling vent, fan, or space heater. Heaters remove moisture from the air and exacerbate or cause dry eyes, but you can counteract this effect by using a humidifier in your home. A humidifier will replace lost moisture and make your eyes feel much more comfortable. If you don’t want to purchase a humidifier, you can place a pan of water on top of your radiator for a similar effect. Wind and excessively cold or warm weather will dry out your eyes. If you’re planning on spending more than 15 minutes outdoors, you should be sure to protect your eyes. You can wear sunglasses and a hat to prevent cold wind and sun from irritating your eyes. If you wear prescription eyeglasses, you may want to ask your eye doctor about prescription sunglasses for further UV protection. You should also protect your eyes from smoke from fires and cigarettes, as smoke will also dry out your eyes.